Despite being a bold title ‘death: the human experience’, in all of the exhibition’s branding, omits the use of capital letters. Perhaps this is a nod towards the universal nature of death and its (nonhierarchical) relevance, which is very much the focus of the exhibition. ‘All eligible, everyone welcome’ a further subheading might read. Alternatively, it is an invitation to review the word ‘death’ without the established connotations that accompany known and capitalised nouns; familiarity is dismantled and interpretation is set free. 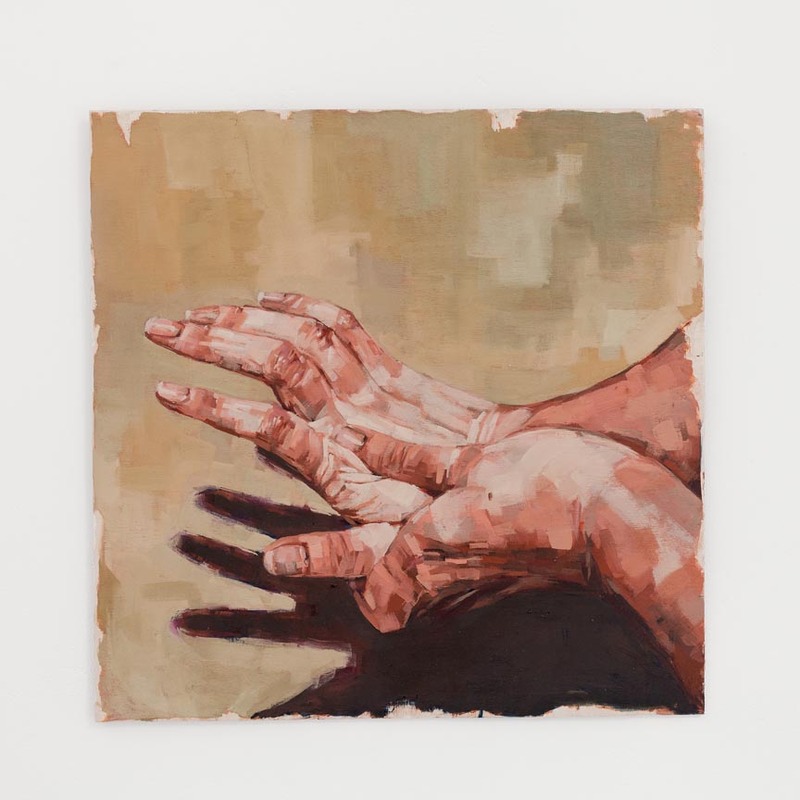 There is certainly the sense of the open-ended and unresolved to this exhibition, compelling to an extent, but at times leaving me floundering. The exhibition contemplates five key human experiences of death, each with its own space and display style: symbols of death, stages of death, attitudes to death, human remains and science and ethics. It is a comprehensive survey, objects and images relating to every aspect of the subject are presented alongside engaging interactive features and a selection of thought-provoking quotes. The curators have been careful to warn visitors about the sensitive nature of the exhibits and I am gently informed as I enter that there are human remains in one room that I might choose to avoid if I wish. Such is the presence of death in society that metaphor and connotation are unavoidable, but maybe this one should have been avoided… Walking into the first, corridor-shaped room of the exhibition is like entering a huge and gaudy coffin. Luxurious pink material drapes from the walls with a pronounced but distracting opulence. In front of this magenta mass, exhibited in glass-domed displays are objects symbolic of death: a taxidermy vulture, a funeral wreath of white lilies, the fragile orange and brown frame of a Death’s-Head Hawk Moth and the exquisite, delicate skeleton of a small Horseshoe Bat. Here, and throughout the other rooms, the exhibits range from recognisable articles, commonplace in British mourning ritual, to the more obscure and unfamiliar objects of other cultures and ages. As someone wary of the most escapable of enclosed spaces, the thought of being buried underground unnerves me to say the least. There is also a poignant sense of futility to this tender, almost hopeful act. In my opinion, highlighting these very personal and very human responses to death are where the exhibition is most successful. It poses the question to the viewer, about what we would wish for our own death and burial. How do others see us, and how might this be summarised in the objects left with us when we die? “A hearse represents death and funerary rituals because it’s seen at the time of a funeral. Even an empty hearse is associated with death”. It is at points such as this within the exhibition, that it feels necessary to question the purpose of museums and the intentions with which they display their artifacts. Aside from collecting and cataloguing, the most obvious function of the museum is to impart knowledge; while this display is certainly educational, it is with a sense of something lacking. As many of our Cafe Morte members make work involving found and made objects, the notion of conceiving death through tangible artifacts seems very relevant to our collective research. Our upcoming show ‘Lost for Words’ could likewise be titled ‘death: the human experience’ and we are likewise exhibiting objects and images with a broad and encompassing scope on the topic of death. However, where I feel art may have more of an emotional and meaningful impact is the freedom it allows viewers to interpret the matter with their own sensitivities and experiences. Where the museum is informative to the point of being problematic, the art exhibition illuminates with the bounds of the viewer’s imagination as its only limit. We can now officially and very proudly announce the exhibitors for Café Morte’s ‘Lost For Words’ Exhibition. There will be a series of events and discussions running alongside the exhibition from the 6th-10th January which will be announced closer to the time, so make sure to follow us on Facebook, Twitter, and Instagram for updates from the Café Morte team. Joanna Hulin- What makes painting (or the act of painting) important when depicting death or dying? To start with, I established why painting (out of all the choices we have today) could possibly be the medium of choice when expressing death. Through numerous pieces of prose by other painters and my own experience, there are various points of discussion to be had, particularly the questions of What aspects of it make it individual, and how is it different from a practice such as photography? How does one ‘read’ a painting, and what makes it successful or interesting? As host this week I focused specifically and deliberately on painters of varying technical skill throughout the 20th/21st Century who had experienced grief and loss, and whether this had affected their work. A question I wanted to open up for discussion was, “if they were affected, how did it change their way of painting?” Painters that were brought up in the discussion included Edvard Munch, Francis Bacon, Marlene Dumas, Picasso, Justin Mortimer and briefly, myself – which gives an idea of how varied I wanted the work to be. It is notable to point out that each of these artists have all experienced loss in a completely different way, under various circumstances. Munch lost his sister, Bacon his partners, Picasso his friend, and Dumas her mother. These all turned out to be pivotal in deciding the direction of their artistic careers. 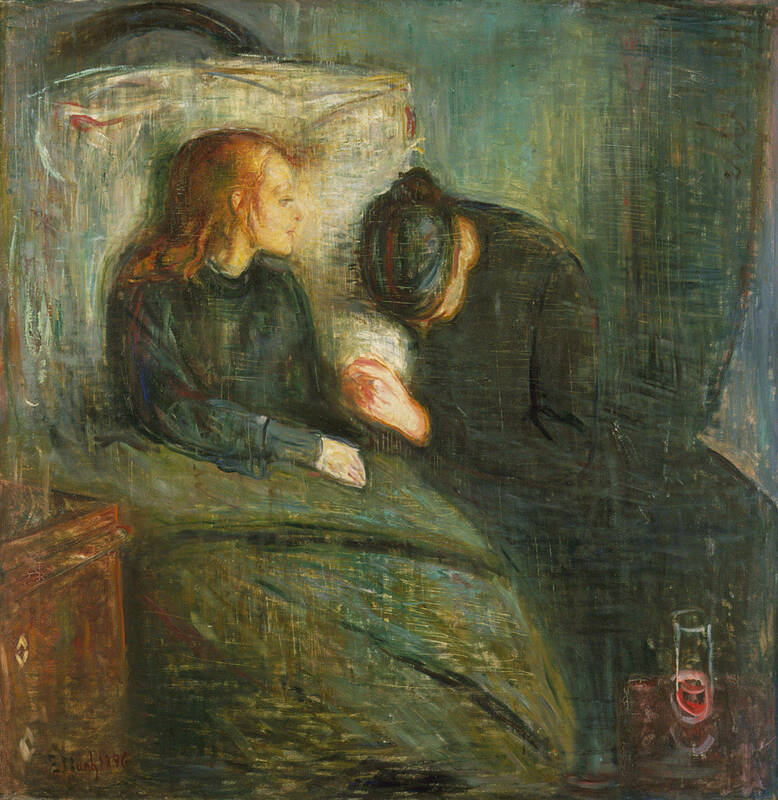 Munch experienced the death of his sister very early on within his career, and this would then turn out to be an incident that would haunt him for the rest of his life. This has been portrayed in the work ‘The Sick Child’, the composition of which was constantly revisited throughout his entire life. 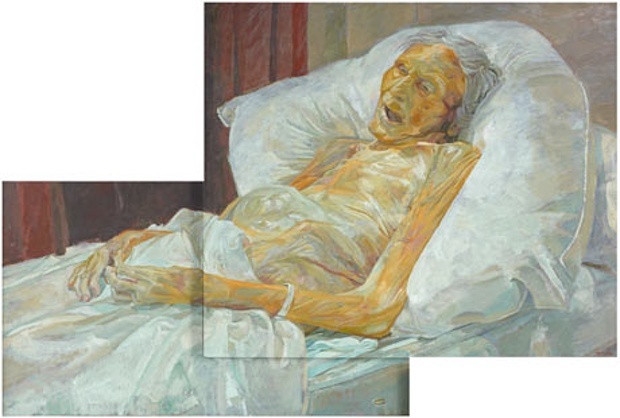 The piece is a portrayal of his sister, Sophie, sitting up in bed at the time of her illness. Munch seemed to want to recreate this scene just before her death ‘perfectly’, but apparently never could, as seen by his numerous attempts. At this point it should be noted that more traditional methods of making art (sculpture, printmaking, painting) were the only things available to make an image, however this did not stop Munch straying from the norms of ‘classical’ painting at the time, as we can see through his fluid, rapid brush marks. 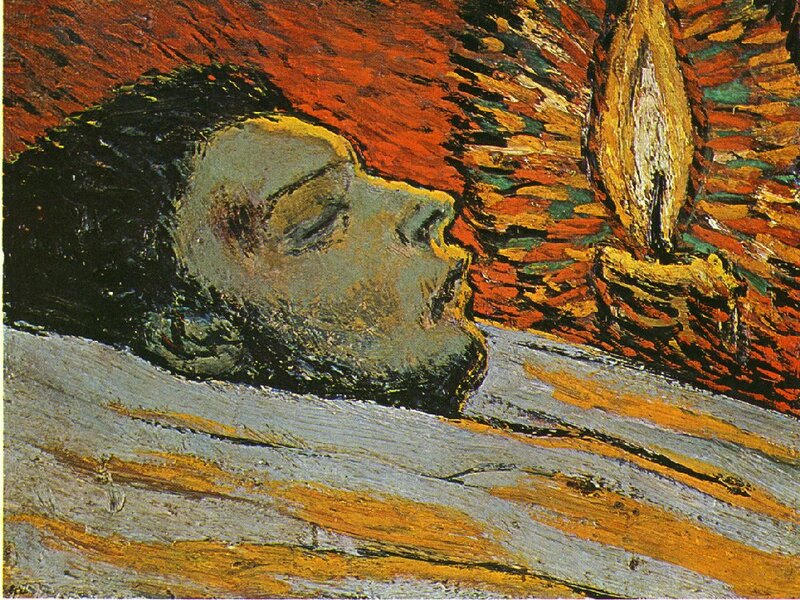 This hurried, expressionistic style is also seen in Picasso’s painting of his friend Casagemas lying in a coffin, after committing suicide at the age of 20. It is argued that this event heavily inspired his ‘blue period’, with Picasso noting that “Thinking of Casagemas being dead makes me paint in blue“. Though many of his friends and colleagues died over the years, the ones that most notably affected him were the deaths of his lovers, Peter Lacy and George Dyer. Dyer’s suicide the evening before the opening of one of Bacon’s exhibitions left him distraught. Though Bacon was often cynical and did not speak particularly openly about his many losses, this changed with the production of ‘Triptych May-June 1973’. 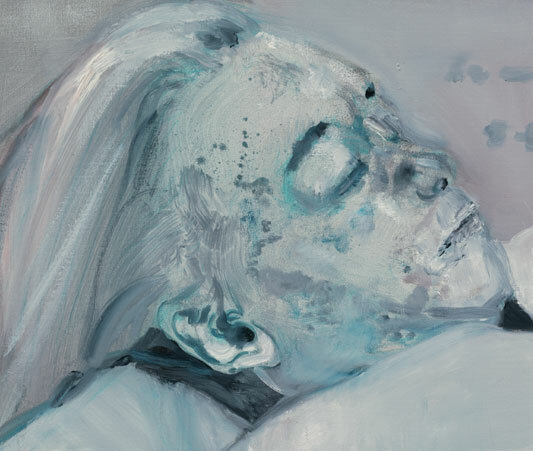 Other painters that were touched upon throughout the session included the work of Justin Mortimer, Jenny Saville and Daphne Todd, whose works are all, in some way, commentaries on mortality. Many of these use transference to create a discussion around mortality: Mortimer and Saville’s most well-known works do not use any references in which the artist is familiar with the subject being painted. Many are extremely detached – which creates an interesting discussion into whether this ‘barrier’ is a product of over-saturation of troubling news articles, as well as the almost chronic fear of death in today’s society. I noted that despite this trend, Todd in particular is interesting due to her literal painting ‘Last Portrait of Mother’, for which she won the BP Portrait prize in 2010. This image seemed to resonate quite intensely with the rest of the group. “In 2007 my mother died at noon. and departure, but also about transformation and freedom. A spirit set free. My grief and her relief. I touched briefly on my own experiences with personal deaths being integral to my work; and I stressed the importance of anonymity. The conversation then turned to moral dilemmas in visual art, particularly when talking about personal themes in work. At what point is it ‘acceptable’ to introduce who the sitter is, particularly if they are the person who is facing the realities of being mortal? Upon writing this post I realised that the anonymity could possibly be essential in the work due to the mystery – the tantalisation of the audience, leaving them wanting to know more. In my case it was both this and feeling uncomfortable with the thought of something personal being so open, which many artists find a difficult obstacle. Andrew [Ross] and I also spoke about why we feel art relating to death needs to be made at all. I was asked what I would like from making the work, and whether it is something for myself or for the audience. My own opinion is that if the work was merely for myself, there would be no point in being a practising artist, as I would not be showing anybody my creations. I personally place an importance in the feeling of being ‘connected’ with others – that is, to be able to relate or empathise with certain situations or people, and in this case it is being able to ‘speak’ to those who have experienced grief, or being able to inform those that have not necessarily been as affected by it. CAFÉ MORTE meets at the Saatchi Gallery. The exhibition is Dead – literally. A sculptural pile of dead mice greets the audience on entering the space. Artist David Falconer titled the work Vermin Death Stack, which is exactly what it was: a floor to ceiling stack of dead mice. As a child I would have been enchanted by finding a multitude of death piled so high. My adult mind however finds it only mildly entertaining and I require so much more from art. Nothing is left to the imagination, nothing to contemplate and certainly no space for the viewer to enter the work. It’s all very literal. Titled Dead – a celebration of mortality, a question is raised as to what if anything Charles Saatchi would like the audience to consider when viewing the works in this exhibition? Jordan Baseman’s skinned cat and dog (The Cat and The Dog) hang on the wall like hunting trophies. The trophies of death collected by artists. Meaningless conversations emerge between the works. We wonder how the artists felt to have their work presented in this context? If Saatchi had wanted to curate a powerful dialogue around the tabooed subject of death he could have selected any number of poetic works from his collection that address ideas relating to mortality such as Belinde De Bruyckere, The Black Horse, or Marianne Vitale sunken gravestones made from reclaimed wood or perhaps Sun Yuan and Peng Yu Angel. I have had numerous encounters with death at the Saatchi Gallery that have, left an impact on me emotionally. I felt I was able to question the deeper issues of mortality in the midst life while in the presence of these powerful works. Instead we encounter the somewhat humorous Littlewhitehead’s It all Depends on Ones Fantasies as a Child, a pile of corpses emerging from black rubbish sacks. Many of the works seem to reference a sinister desire, a dark place of the imagined horrors of death, a place perhaps reminiscent of childhood anxieties. I am reminded of the experience of riding on a ghost train and the delight in knowing that the gory exhibits were not real. The pleasure to be found in dark fantasy can be seen in Daniel Brajn’s black melting dripping figure clinging to the floor. We know it is not real. It occupies the space of the nightmare. The associations with Gothic narratives in literature, the darker side of human nature are present if you are searching for a context, though somewhat limited. In the heat of a summer day in the city we left feeling cold, unmoved, unchanged, untroubled and a little disappointed. Hoping it would reveal something I had missed or not understood, a deeper level to the exhibition perhaps, I bought the book. However it was lighter than the exhibits- Presented in the shape of a slab of marble, gimmicky and full of entertaining stories, such as the story of James Campbell who was run over by his pet dog. Apparently he left the car running and jumped out to open the garage door when at that moment his pet dog jumped into the front of the car and sat on the accelerator. He was killed outright. His wife was unable to do anything, surely must have laughed a little? The book illustrates this point with a photo of a dog sitting behind a steering wheel in case we missed the content in the text. I wonder if the words have been generated by stories of death found in the Sun newspaper? I laughed a lot when reading the book. This must be the point. The unspoken language of death brought to us in a coffee table style book, light and entertaining, perfect in fact for our CAFÉ MORTE discussion over tea and biscuits. We were genuinely able to avoid any serious questions relating to mortality. Not sure if this kitsch and humorous exhibition is in fact a ‘celebration of mortality’ or could have more appropriately been tilled ‘a celebration of the obvious’. It certainly did make the often, heavy subject of death light and entertaining.